Make yourself comfortable now with Heated Seats!! 25.5"L x 11.5"W The Seat Heater elements are paper-thin, and install between the seat cover material and the seat cushion. They are fully water-resistant (not waterproof) and pose NO problem with damp winter cloths, spilled beverages, or wet pets! 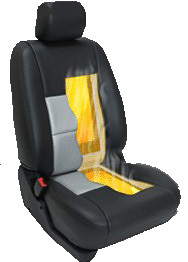 They are NOT visible and do not detract from the finish or look of your vehicle's factory upholstery. A small three-position switch (off, low, high) is installed in the lower seat trim panel for a "factory" type appearance. All wiring and the heat element controller are concealed below the seat or run under the door sill trim plate, carpeting, etc. It is fully compatible with existing power seats or multi-adjustable "sport" type seats finished in cloth, vinyl, or leather. You will need a power source that turns on/off with the ignition switch, if your car seats are electric you already have a power source (check if it works with ignition switch, otherwise you will have to run a wire to the fuse box) under your seat for these seat heaters and it comes with a 24" (600mm) Power Lead to splice into the Seat Harness. Consistent and controlled warmth (up to 121 degrees) with carbon technology. Element can be trimmed to fit any seat. The aftermarket heater with original equipment specifications. The heat can be adjusted to two levels to suit your needs.